The garden-orchard features three traditional Bolognese vegetable species and brings together over 150 historical varieties of fruit trees of local origin or regional fame. Planted in 2012-2013, this outdoor section of the museum offers visitors the opportunity to experience the shapes, sizes and colors of the past. Guests learn about the natural timeframe for ripening and rediscover the uses and flavors of these historical fruits through demonstrations and tastings. 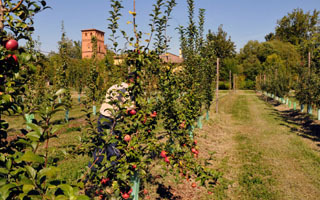 The garden and orchard are among the successful outcomes of a project of the Province of Bologna to safeguard and promote biodiversity, financed with funds from the Regional Rural Development Plan and produced in collaboration with the University of Bologna’s Department of Arboriculture.